ATLAS model reaches 10k in 19 Days. In 19 days the ATLAS model has gone from publication to 10k. The project has enjoyed a lot of support since its publication on Cuusoo. That is to be expected for a subject that has over 3000 people working on it. The real key to its success though was the project getting a link from one of my favorite websites, I f***ing love science. The resulting swarm of support actually, apparently brought down Cuusoo. Another fine example of the importance of social media on getting projects to the review phase. "Another fine example of the importance of social media on getting projects to the review phase." You mean another fine example of how a less-than-deserving model gets insane support while other models wallow in the dust. I hope the final product looks nothing like that. Lots of tiles would make it slightly enticing for me as a parts set. This Cuusoo Atlas doesn't have any playability and isn't very nice as a display piece in the current state. The 1970's called and they want their LEGO model back. The large scale LEGO version of ATLAS looks great. The question for this one is how many of those 10,000k voters will buy it if it's made. I agree with The_Chosen_1 and a few other people; this model is extremely bland and boring. Nobody would care about it at all unless they knew and understood what it was and even then they wouldn't be impressed. I've lost faith in CUUSOO after hearing that a basic and ugly model like this has achieved the 10,000 quota. However, although I supported it, I'm really hoping TLG either goes with the larger model or at least re-designs it significantly. This one is just not terribly attractive. It'll also have to get past Alatariel's Female Minifigure Sets, the final concept of which is a grouping of three science-based vignettes. The summer review's certainly going to be science-y. Like the idea, but horrible model. Hopefully it will get the major redesign like the Minecraft one got before production. They don't have to accept it just because it got 10k votes. I'd be shocked if they went with something so lame. As I read further I realized that the voting was for the small version. I don't see how this could have obtained 10 votes let alone 10k votes. If there was a vote for the worst model to receive 10K votes....this will be the one. Getting this to 10k was the work of one user on the website Reddit. It's canvassing. 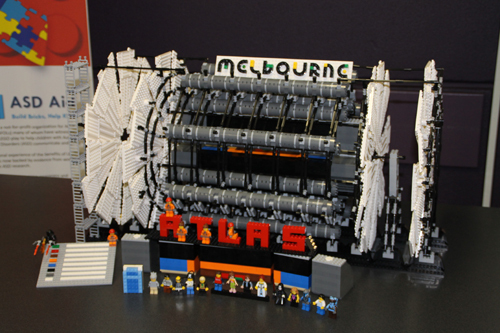 The title of the post was "LEGO has created a scale model of the ATLAS experiment at Large Hadron Collider. If it gets enough votes it will be sold wordwide." Boooooo. This is a crap project, I hope this really isn't put into production. a glaring example of much that is wrong with Cuusoo, and more generically, poorly thought out crowd-sourcing implementations. A lot of science projects have been passing the review stage, but I hope that this one does not (no offence) but it just looks boring. I agree with the majority: it's rubbish. It's a bad model of something that nobody recognises and has no playability whatsoever so I would say it's highly unlikely to pass review. The first time I saw this, I thought it was a Satellite from the early space exploration days...so I was awfully wrong! But maybe they could rename it as such? Reading about what it does is appealing and all, but that hardly translates into something good on bricks with this, ehhh... model? But looking on the brighter side, this just gave me some optimism about putting something on Cuusoo, if something like this gets supported...really! Another scientist here, and another lego lover that thinks this is a pile of crap. In fact, maybe that is what is needed. A big pile of reddish and dark brown bricks, and all lego fans that want to see changes to cuusoo to vote for it. It's better that I don't comment. Should let my lawyers handle a comment on this / on Cuusoo / on social media. As another scientist, this kind of crap does lego loving scientists a disservice. I actually think the for the sake of brickset the news article should be changed to add more commentry, otherwise it might seem like the site is itself supporting the project. Is this thing supposed to spin or something? What does the model do? How come it's not for the larger version that would at least be more interesting? so they are gonna sell this hunk of garbage, but the god like and sweet looking UCS sandcrawler is being nixed - even though they already have the license????? Folks. I'm so thankful I'm not alone. All your comments here are giving me hope. I thought I was losing my mind already. I never realized science was not exempt from blind fanboism. @miket: it wasn't the work of that one user (and in fact Reddit is notoriously bad at getting projects actual supporters, it will only get you tens of thousands of views, and hundreds of Reddit comments that go "meh, they asked me to register, screw them"). It was the work of the "I f*cking love science" Facebook group, to which it got posted twice within four days, getting it from 632 to about 7500 votes in the first burst, and then from 8k to 10k in the second. Going by the date of that Reddit post, it came along after the second burst was all but over. Still, thanks for linking to it, as it beautifully demonstrates a staggering amount of ignorance and misunderstanding, starting with its very title. Reading through the comments there is really like looking at a horrible car accident. I sure hope someone at CUUSOO will be reading it as well. @CCC: perhaps not as drastic, but certainly it should be possible to create (or find) a Facebook group titled "I f*cking love soup", and submit a model of a bowl of soup. @Schwallex: Interesting. Only assumed it was reddit when I saw the comments and the number of post. It's still canvassing, but guess it's up to Cuusoo to decide if they want that. I too feel this is an utter garbage but it brings to light one other problem with cuusoo: proposal to reality. The Shinkai and the Minecraft are drastically different from their original builds on Cuusoo but were accepted as ideas. Whereas the Hayabusa and BttF Delorean have only minor adjustments and toted as great designs. That being said, there is a conflict of rules on cuusoo. On the one hand, some projects are rejected because the build is too large or too complex or too simple, whereas other projects have the privilege of being completely redesigned. When its convenient, this rule is used or excused. I would totally volunteer to start a soup project, though. One day, as time permits. Because in point of fact I do f*cking love soup. And not many people can cook soup, so the model would be very educational as well. I'm an outreacher. I think a lot of the posts here are quite rude. I don't think this would be a very fun set at all (the other science-based projects, being mobile by nature, at least have swooshability and an exotic environment for display to their advantage), and I think that's going to cripple its chances of passing review. But at the same time, it's far from "garbage". It's a quite neat model using quite neat building techniques to achieve what I can only assume is a very authentic likeness of the source material. These scathing posts are an insult to the builder. Complain all you want about the LEGO Cuusoo process and its reliance on social media, but don't for a minute start taking it out on the model itself. It wouldn't make a good set for most people, sure, but that's true of the grand majority of AFOL MOCs, many of which would garner positive feedback for these kinds of building techniques even if they are not especially exciting to look at. I am relieved to see that there are many others who share my opinion about this project. After it rocketed to 10,000, I thought there was something I was missing. This project has almost zero playability. That fact in and of itself doesn't condemn it, as the same can be said about most of the Architecture theme sets. However, this project is ugly and is a pretty poor representation of the real thing, which makes it next to worthless. The designer's original model, with almost 10,000 pieces, didn't have those problems, but at that size, it wasn't viable as a Cuusoo idea. If The LEGO Company thinks they can turn a profit by productizing this idea, more power to them, but I would bet against it heavily, as most of those who supported it are likely to vanish when the product hits the stores. I think it's pretty much the same case as Purdue Pete. Lego wants projects that have broad worldwide support, not projects that can get 10k votes on a web survey. Seriously... when we could have any number of far more worthy projects reach 10K, this passes? I'm sorry, but the model is only passable, we already have 3 science-based projects for sets and... well, that sums up my grievances. Additionally, as @SenatorBlutarsky has pointed out, most of those who supported it may well "vanish" if it is actually released. That, I think, is the problem with these "viral projects." 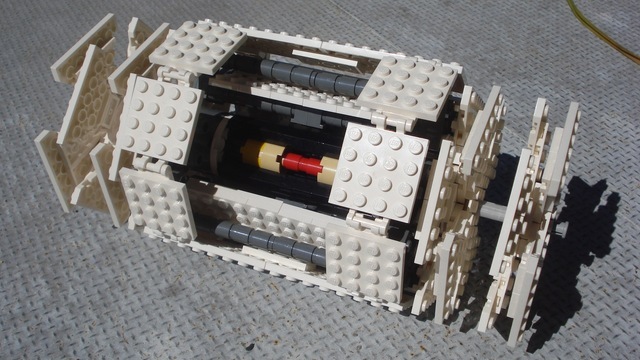 When they are blogged about, they may attract large quantities of support, but little of it is necessarily from the LEGO fan community who will actually be reliable about purchasing those sets. This may have attracted a lot of support from the scientific community, but I'm going to go out on a limb here and guess that sales will not be all that great, provided it passes. Sorry. :/ Besides that, I'm still waiting for an excellent, original model (like Peter Reid's Exo Suit) to actually be made into a set. EDIT: @smackfu: Exactly, hit the nail on the head. I'm sorry to say that very few AFOL's will like this model. I think the Lego group might agree that the model has no playability and very little merit as a Lego item. What the... Just what... WHY?!? Another science themed project? How original... I'm not buying this... I'm also starting to get sick of Lego Cuusoo. Starwarsgeek500, I like the minifigure belt - supported!